Some feature articles in http://wattsupwiththat.com/ about Greenpeace. 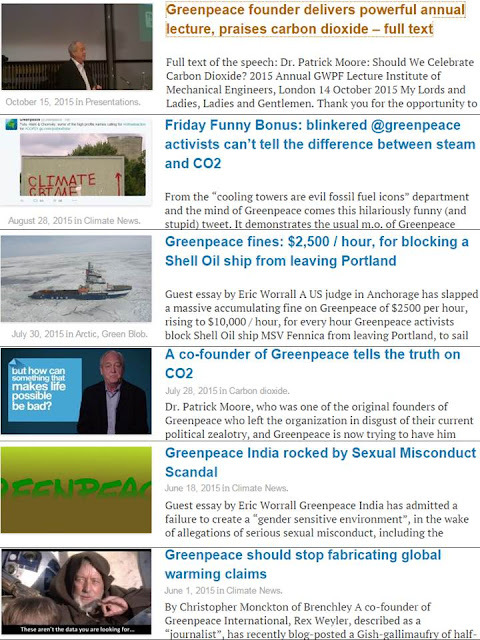 Below are some of my old articles about Greenpeace. 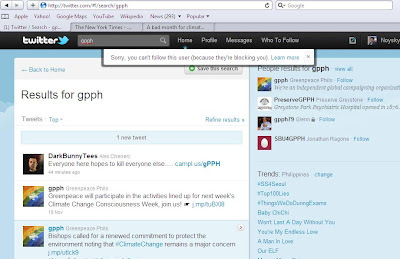 Tonight, after being inactive in twitter the past few days, I checked my twitter account, checked Greenpeace Philippines twitter to reply to whatever alarmism they may be spreading. 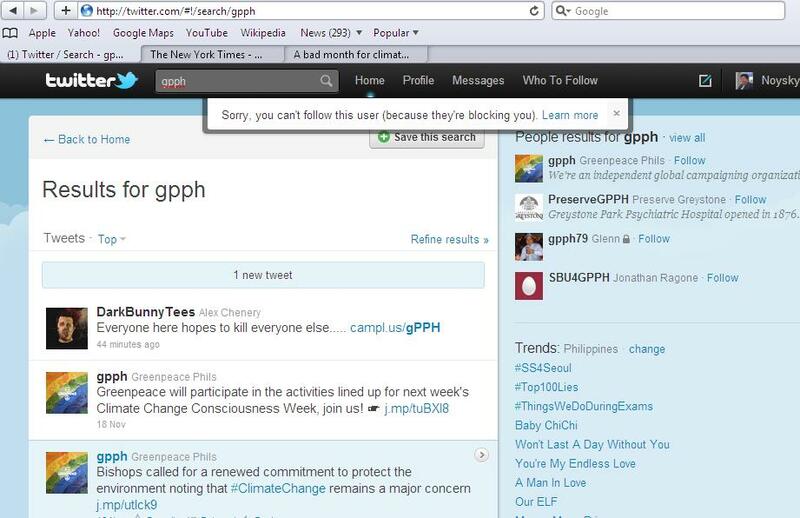 Surprise, they are blocking me! Great guys, you look cute and beautiful. Cheers Greenpeace. Long live AGW religion and climate rent-seeking. Enjoy big money and fame by fooling the public big time. Now the outgoing leader of Greenpeace admitted that they indeed exagerrated their claims of an "ice free" Arctic by 2030. The UN and Greenpeace (and also WWF, other environmentalist groups, big and small, national and international), live with this simple motto: "Be dishonest if you must, continue scaring the public, we get our hundreds of millions of dollars annual funding." Greenpeace made the claim in a July 15 press release entitled “Urgent Action Needed As Arctic Ice Melts,” which said there will be an ice-free Arctic by 2030 because of global warming. One adverse effect of climate alarmism is the implicit desire to fight high economic growth, to fight modernization. The militant environmental activists would rather see people riding bicycles and horses than ride more cars, buses and trucks because of the high carbon emission by the fossil fuel-powered vehicles. If people ride bicycles or horses, they cannot transport several tons of farm output -- rice, corn, bananas, vegetables, chicken, swine, etc. -- in a short period. Farmers will experience huge farm losses as those agri crops, when not transported quickly to the consumers in the urban areas, will easily rot, or suffer quality deterioration, resulting to lower farm income if not losses. Among the militant and notorious anti-coal, anti-fossil fuel, anti-carbon, anti-nuclear, anti-many things environmentalist groups is Greenpeace. The others are Oxfam and the World Wildlife Fund (WWF). Greenpeace helped agitate the folks of Maasim, Sarangani, a small town in southern Philippines, into opposing the construction of a coal power plant in the area. Their local partner group is the Maasim People’s Coalition on climate change (MP3C). See the report here today, Residents oppose coal-fired power plant project. The Philippines is projected to experience significant power failures in the next six years or less because of not enough power plants to sustain increasing power demand by a growing economy of 94 million people (as of 2010). Thus, there is a pressing demand to put up more power plants now as it takes at least two to three years to build a new power plant to produce additional energy. 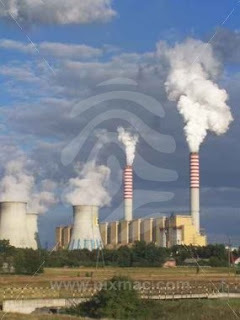 The proposed coal power plant is projected to produce 200 MW of power for Mindanao in two years. But the militants are opposing it and they are sometimes effective in launching idiotic campaigns. Greenpeace campaign to kill coal and other non-renewable but cheaper power sources in order to "save the planet" and their new campaign to pressure the Philippine government to have at least 50 percent of power to come from renewables (solar, wind, biomass, etc.) by 2020 rests on the lousy "science" of AGW hypothesis. Renewable power sources are fine. They expand the range of choices for the consumers. Rich and environmental do-gooder consumers can power their houses and farms with solar and wind if they wish to, fine, no problem. So long as they pay the market rate of such power sources. These are expensive power sources for now, and their power supply is not stable and not reliable. For instance, a supposedly 50 MW wind farm can actually produce only about 10 MW power on average as the 50 MW is the maximum power that it can produce -- if wind speed is at its optimum all the time, 24 hours a day. To force the country and the private enterprises and households to rely on expensive and unstable power sources is asking the country to suffer more poverty, more power outages, more unemployment. To Greenpeace and similar environmental activists, I have been challenging you to a public debate on the science of AGW. Global warming was true, and so was global cooling. The planet's climate cycle of warming-cooling-warming-cooling is mainly due to natural factors (the Sun, ocean, water vapor, clouds, volcanoes, GCRs, etc.) and not because of human CO2 emission. Prove your voodoo science before you hostage this country with your alarmism.